Lightweight Flywheel - 1999 - 9/2003 E46 3-series, E39 530i/528i/525i 5-speed models. IMPORTANT: NOT FOR 330 6-speed or 325 built after 8/2003. See application guide for these applications. Ultimate throttle response and faster acceleration at your command! National-level race winners use the UUC Stage2/M5 clutch combo. UUC's exclusive-design "sprung hub" clutch design Stage II lightweight flywheel has been named one of European Car magazine's "Top 10 Products"
Tipping the scales at only 8.5lbs, this aluminum flywheel boasts the best features in its class (high-speed balanced, correct dowel hole, replaceable friction surface, Made In USA quality) , but is designed to use the clutch disk, pressure plate, and throw-out bearing from the 3.6 liter E34 M5. The total weight of the M5 clutch disk and pressure plate combo is greater than that of a stock E46 3-series clutch, so we have reduced the Stage2 flywheel weight to achieve an overall rotating mass that is essentially identical to a typical 11.5lb lightweight flywheel that utilizes a standard E46 clutch. 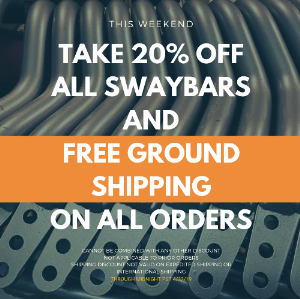 Maintaining the reliability and over-the-counter availability of a BMW factory part. Greater clamping force than standard 3-series clutch. Incorporates a sprung-hub design to minimize gear rattle, includes heavy-duty steel pressure plate. The advantage of a sprung-hub clutch design is improved resistance (and in many cases, complete elimination) of the residual chattering noise at idle that some lightweight flywheel-equipped cars can experience. Because BMW specced this clutch for use on the powerful S38-series engine in the M5, it is up to the task of handling the output from a modified M50-series motor (all '99-'06 6-cylinder E46 3-series and M3, and E39 5-series/6-cylinder models). UUC customers have been using the Stage 2 & M5 clutch setup in turbo or supercharged E46s with fantastic results. Our own testing has shown the M5 clutch to reliably handle in excess of 450hp. The UUC Stage 2 flywheel and clutch assembly has been used in the "test platform" M3 of Eurosport High Performance's supercharger development, reliably handling many miles and dyno runs in this powerful machine. UUC also provides many US and European turbo and supercharger tuners with the Stage2 setup. You can be assured not only of the performance increase you will experience, but the long-term ease of ownership that comes with knowing a replacement clutch is never any further away than your dealer's parts counter. 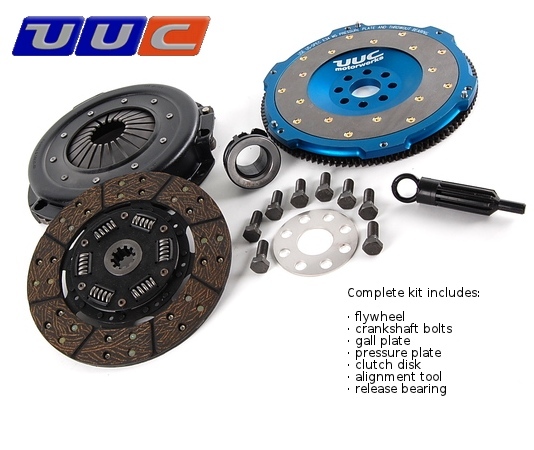 Please call UUC to discuss your clutch requirements. All kits come complete with Stage 2 flywheel, pressure plate, clutch disk, throwout (release) bearing, crankshaft bolts, gall plate, and loc-tite. models with manual transmission only. dowel pin hole: enlarged like factory-fit. friction plate: replaceable, 1050 steel (suitable for any clutch material). From Anton B. of Brooklyn, New York on 5/11/2008 .